Akrotiri Meleha is the large circular peninsula extending northeast of the city of Chania. Here is located the international airport of Chania (political and military) and also the NATO naval bases that occupy the entire south coast of the peninsula within Souda Bay. However, among the rocky cliffs of the peninsula, there are some remarkable beaches and some important, historical and religious sites, worth visiting. The feature with most beaches on the peninsula is that, although is located in the northern part of Crete, they aren't affected by the winds, as is the case for other beaches on the north coast. Therefore, have in mind these beaches, when you want to go to a beach where you'll definitely find a calm sea. The Graves of Venizelos is situated on the hill of Prophet Elias, in a very beautiful landscaped site offering panoramic views over the city of Chania and its region. The following attractions in Akrotiri lie in the same direction, so if you wish, you can combine them into a ride. Drive to reach the monastery of Agia Triada of Tzagarolon 2 and continue to Gouverneto Monastery 3 , where the road ends. Then you will have to walk downhill on a steep paved trail to the cave of the Virgin of Arkoudiotissa 4 and the abandoned Katholiko 5 . The monastery of Agia Triada of Tzagarolon is located at the foothills of Stavros region. 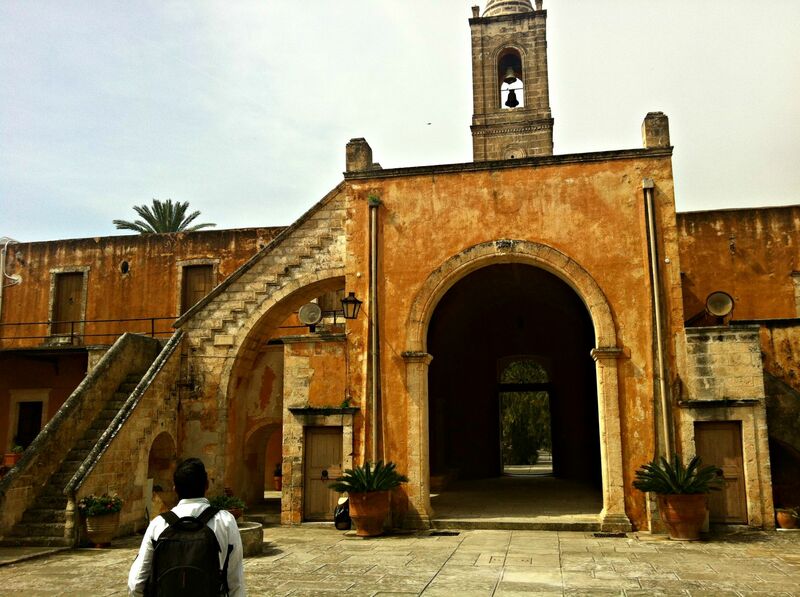 It is designed and built by brothers Jeremiah and Laurentius Tzagarolas at the end of the Venetian rule in Crete, around 1634, and completed the period under the Ottoman rule. The monastic complex is an architectural masterpiece, which is visible in every corner of it, and this by itself is a reason worth visiting. Apart from the architecture, you'll have the opportunity to marvel the precious relics kept in the monasteries's museum. Furthermore, the monastery exploits their land and produces olive oil and wine using biological procedures, which are bottled and are available for sale. You'll see it all in their special exhibition room, while in the cellars of the monastery, you will have the opportunity to try their aged wine. 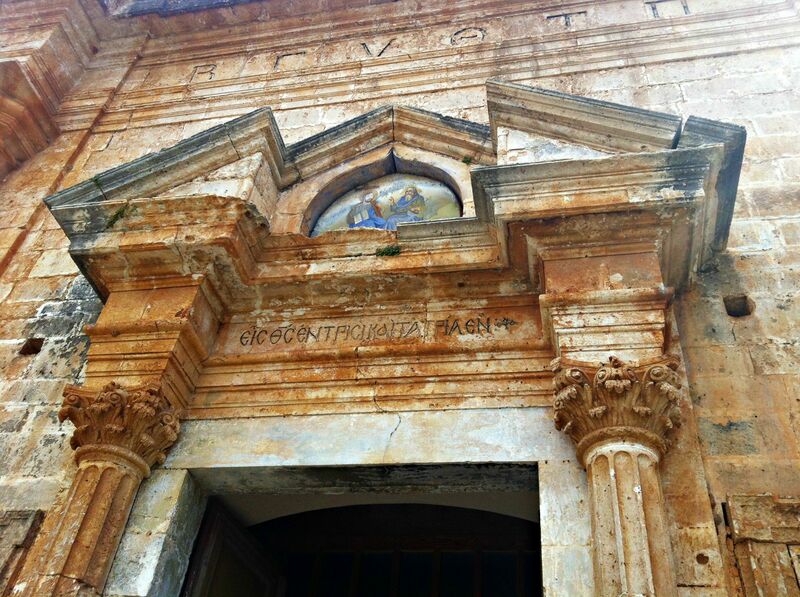 More information about the monastery of Agia Triada of Tzagarolon, you will find on the website of the monastery. 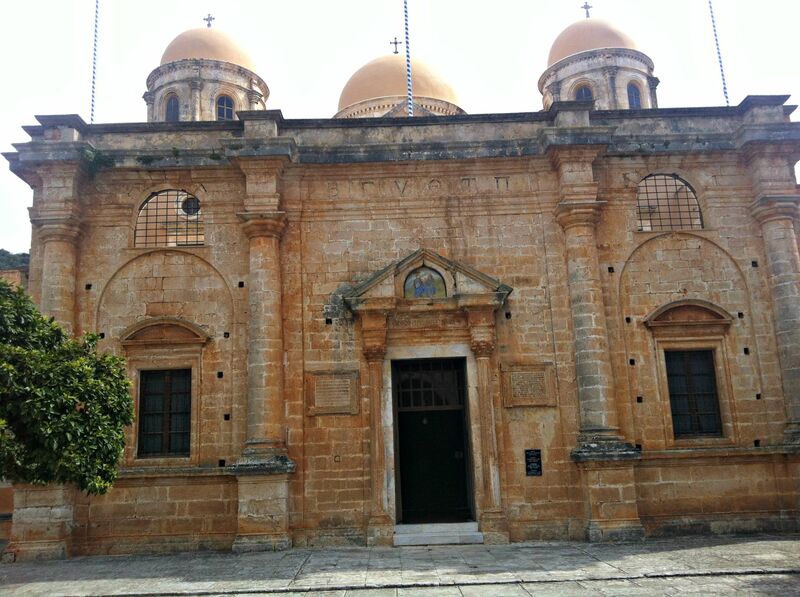 The Gouverneto monastery, with its temple dedicated to Our Lady of the Angels, is the oldest monastery of the Akrotiri peninsula and one of the most important monasteries of Crete. In spite of the fact that the archive of the monastery destroyed during the Turkish occupation on the island, it is estimated that the monastery began to be built in 1537 by ascetic monks who wanted to protect themselves from pirate's attacks, and that's why they built the monastery like a fortress, with towers on the corners and battlements on the sides of the walls. The monastery suffered several disasters, conversions and alterations of its original shape over the centuries. Indicatively, windows you see were loopholes that have been reconstructed. Some of the original structures were demolished and built new ones, even on the precincts of the monastery. The primary Catholic does not exist and on place has been constituted the one that is preserved, a building at the beginning of the year 1600s. Impressive are the monstrousness masks that adorn the basis of the columns of the narthex, a sample of the style of Baroque architecture. The cave was so named because of a popular folk legend, developed due to the existence of a stalagmite that resembles a bear which bends down to drink water from a stone tank into which the water is concentrated, dripping from the ceiling. "In this area were lived ascetic monks who were in need of the tank water due to water scarcity. However, the water strangely was disappearing. So one day hid in the cave and wait to see what was happening. Well, they see a bear entering the Cave and drinking water from the tank and terrified by the presence of the bear, pleaded Mary to save them. Immediately, Our Lady did its miracle and petrified the bear. To thank Our Lady, built the chapel located in the entrance to the cave which is dedicated to the Virgin Mary." Since then, the cave was named "Cave of the Virgin Mary of Arkoudiotissa" or more simply as "The Bear Cave." Archaeological findings prove that in ancient times this cave used for a place of worship of the goddess Artemis. The Catholic began to be built around the early 1600s to serve the pilgrims who flocked to the place where St. John the Hermit died. St. John the hermit, having started from Egypt, wandered in several areas seeking a suitable place for the ultimate ascetic life and devotion to God. 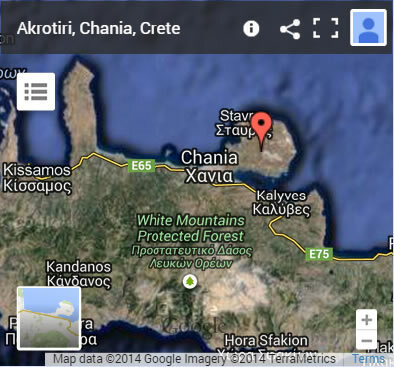 He finally arrived in Crete and ended up in this remote area of Akrotiri. One day, while he was bent over behind the vegetation, a hunter accidentally passed him for animal and killed him with his bow. It is said that he died in the cave located on the left of the last steps down the trail that ends to the Catholic. In the Catholik complex, has been built the cavernous church of St. John, cells that serve the hospitality of pilgrims, as well as a bridge that constituted the main courtyard and served on ascetics, access on the opposite side of the gorge. View this comparison in a new browser window.